New Zealand has brought the world many wonderful things: manuka honey, the kiwi (bird, not fruit), and now a purveyor of electronic dance music with the prowess to draw a decent crowd. 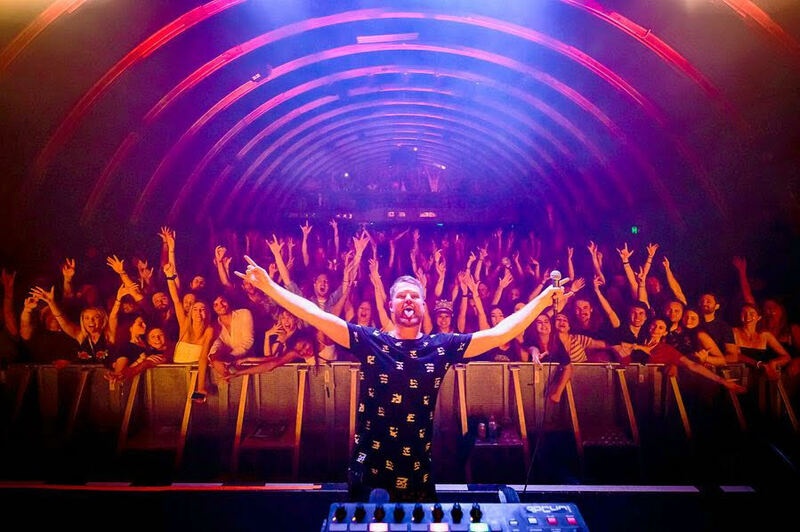 Opiuo has grown quite a following for himself over the past near-decade, and with a steady setlist of up-and-coming electronic artists, the Brisbane leg of his tour looked like a success waiting to happen. Melbourne artist Wonqi Rose had the difficult job of warming the crowd as they trickled in, but she came prepared with a kit bag of smooth, thick sounds and tinges of soul. The contrast came through bursts of trumpet sounds and deep, burning synthesisers designed to burrow into the psyche, and then again through tidbits of R’n’B tunes. She managed to build up and pull back intensity well, but nothing got the crowd going quite like the final build up. Next to the stage were Brisbane outfit Mood Swing & Chevy Bass. They refused to be outshone by their rainbow blazers and rhinestone-emblazoned hats, and their infectious confidence stirred a new energy in the room, especially as they moved closer to the crowd. The pair also mashed in several well-known pop tunes, from Young MC’s classic Bust a Move to Khia’s ever-questionable tune My Neck, My Back, which somehow never fails to get the crowd chanting. Like Wonqi Rose before them, they showed an affinity for genre-jumping, working in swing, jazz, and buzzing synthesisers. Still, it was the live drumming and keytar which ultimately made all the difference. Taking in the outfits, flamboyant dance moves, and facial expressions, it began to feel like the closing party at Mardi Gras, and then all too soon, the set came to an end. In blurring the lines between acoustic and electronic, Anomalie brought the likes of Jack Garratt and Lea Bertucci to mind. He managed the effects with one hand and the keyboard with the other, proving himself skilled at multitasking as much as anything else, and gave the crowd a comfortable grin as he played. The pull of eyes towards the stage kept mobile phones away which was, in itself, a testament to his unique talent. 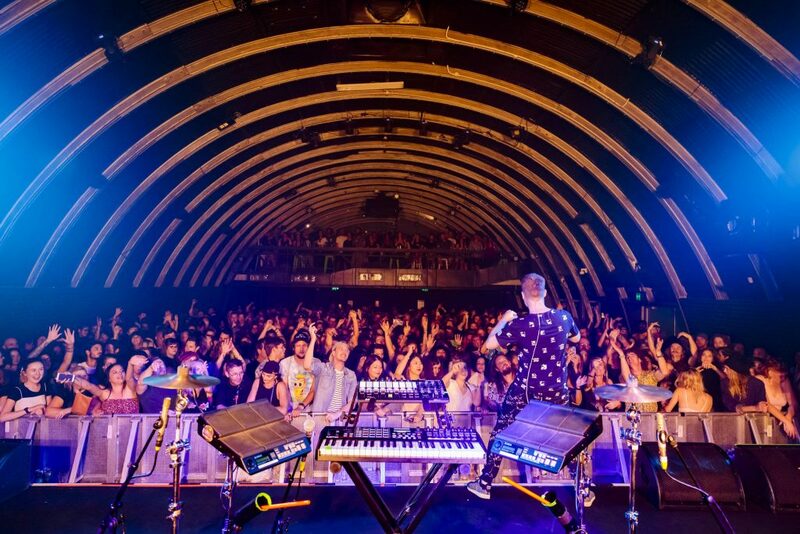 By the time Opiuo hit the stage, the crowd was buzzing with anticipation and the energy of the support acts. The lights changed from a dramatic pink to blue as he set up the first track, his shadow almost eclipsed by bright lights and smoke. 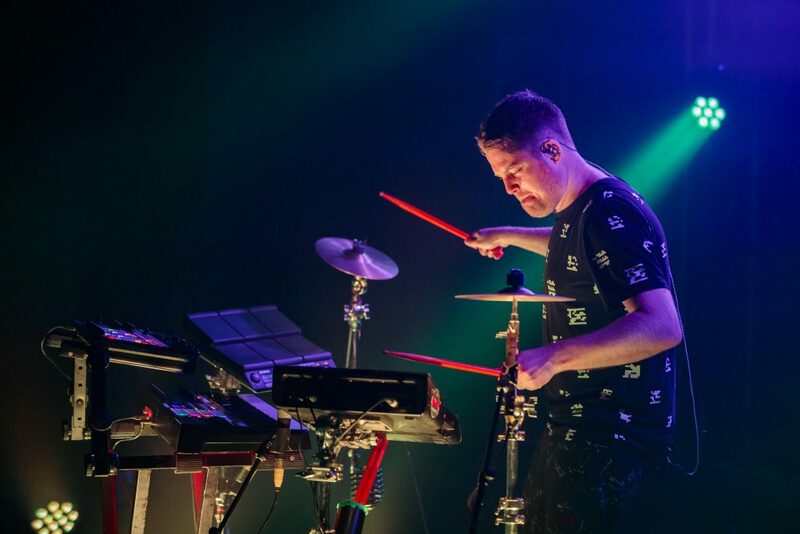 The lighting, which was triggered by the musical equipment on stage, would change constantly throughout the set, often moving in time with the keyboard. Between the lasers shooting out from the front of the stage and the live drumming layered over the track, the crowd had no time to look away. There is no electronica without a build up, and when the first beat drop came, the building itself seemed to move. Even as the set went on and new melodies were woven into the mix, Opiuo never forgot the first rule of electronica: don’t let the energy wane. The rest of the night was a blur of build-ups and drops, lights twirling and dying, and so many sounds blended together that it was hard to believe they all came from one pair of hands. Eventually, he came out from behind the desk to spur on those in the nosebleed section, presenting a rare opportunity to see more of him than a shadow. Ultimately, though, his one goal was clear from the beginning of the set until the end: keep the crowd dancing, and dance they did.